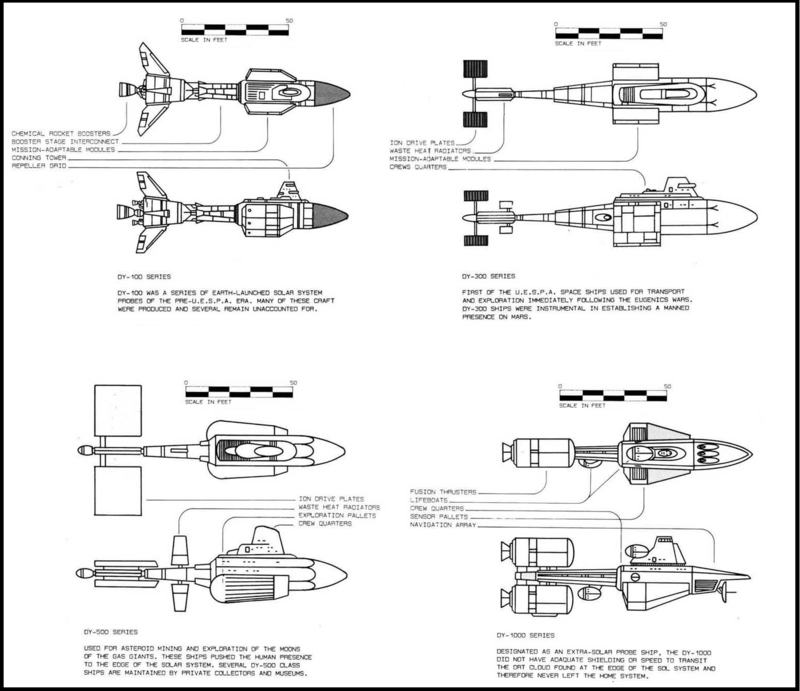 In addition to the above named construction sites, orbital construction shacks and the Moon Colony, thru a mandate by the United Nations, provided most of the material and R&D needed for these ships. Although these sleeper ships were produced in limited numbers, and were only constructed from 1990-2018, two more series were built after the DY-100s. The DY-750 series, built from 2018-2043, could carry three times the cargo (5,000 tons), four times as many sleepers (400), and moved twelve times as fast utilizing a breakthrough in sublight engines. This advanced class was produced at a highly accelerated rate and production was only halted when the situation on Terra began to breakdown into global warfare, culminating in World War III, which decimated large sections of Terra's surface. The final DY-series ships were not sleepers but live cargo. 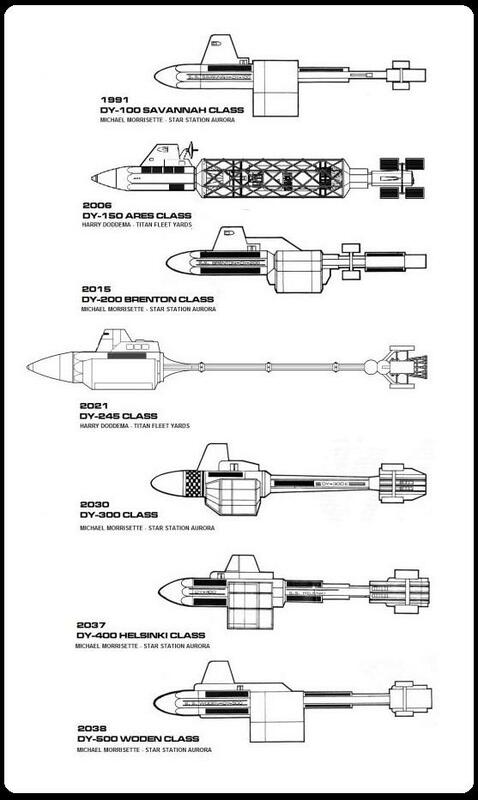 The DY-500s were built as Terran colony ships. 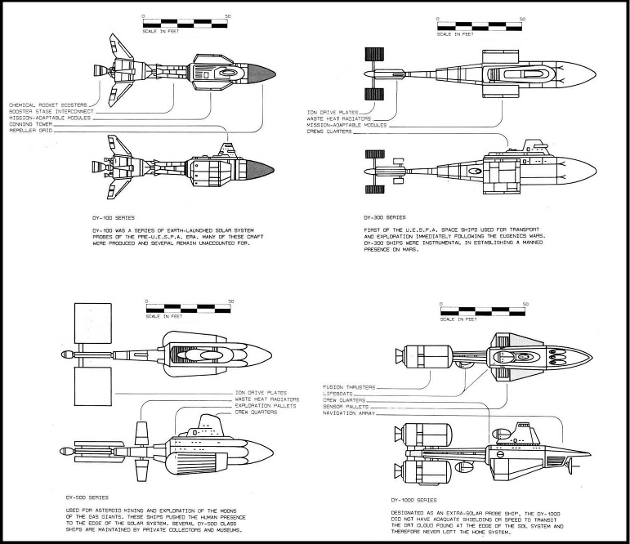 With new low warp drive and capable of delivering 5,000 colonists and their equipment, these ships were the most produced out of all three classes, over 400 units were built, mostly at Goddard Station and the Mare Imbrium Moon Colony. This paper would not be complete without a brief summary of the most famous (or infamous) DY-100 series sleeper ships, the SS Botany Bay. When the Eugenics Wars were reaching their height on Terra and it was clear to Khan Noonien Singh (then ruler of the Common Market) that they would fail to secure all nations under their control, Khan hijacked the SS Botany Bay, which was nearing completion for Australia at High Singapore. The ship launched and was presumed lost until the Federation starship USS Enterprise (Captain James Kirk commanding) picked up the ship lost in space on Stardate 3141 .9 (2266 AD old Terran date). Khan later attempted to hijack the USS Enterprise and was banished by Captain Kirk to Ceti Alpha V for his crimes, along with 96 of Khan's crew. Recent discoveries of sleeper-ships by Federation vessels include new arrivals at Ba'ltmasor, Dytallix B, Cor Culdi, and the Bylaren system. These refugees will be taken to Starbase 87 for resettlement. Over 50 DY-series ships are still lost or haven't arrived at their destinations yet.